Your goal is to collect the highest score from one element suit. Take a card or turn a card, but keep an eye on the Dodekka, if the total goes over 12 you might have to pick up all the cards and some of those elements will count against you. Dodekka is super fun and super quick to learn. 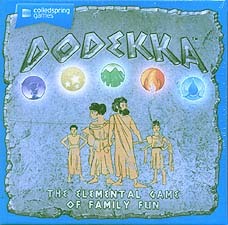 With elements of strategy, probability, maths and a tiny bit of luck, Dodekka is a card game the whole family will enjoy. A great filler game created by the marvelous Andy Hopwood. This is a quick and easy game to learn and can be played by all ages. This is a great game to break the ice with new gamers or as . The game cards are of good quality and bright. I would recommend anyone to have this filler game in their collection. Was recommended this by Phil as a small card game to play with my wife and I have played it a few times now and I quite liked this little game. First of all it is well presented with high quality, well printed linen-finished cards. The artwork is nice in it's 'ancient Greek' style. It is well produced considering the game itself is so small and simple! That isn't meant to belittle or undermine the game in any way though, as this is a good game. It plays like a push your luck card turning game, with a little bit of card counting, guess work and light strategy involved. Players try to collect a suit (or 'element' thematically) with as many higher value cards as possible without having to pick up cards from other suits. Simple but quite satisfying, or frustrating as the case may be! Plenty of the games may result in a negative score, but as long as you do better than your opponent(s) then you are fine. I think if you are playing with 2 you just need to doctor the deck to reduce the cards slightly, like taking a suit out or perhaps a few of the '1's or '2's out as otherwise it will drag a bit possibly. Not played with any more than 2 yet, but would certainly get this out and teach it when an opportunity arises. For £9 it is a nice 'filler' style addition to the collection, pick up a copy and give it a try!